The Alaska Department of Fish and Game maintains active and comprehensive management and research programs to ensure fish and wildlife populations are "utilized, developed, and maintained on the sustained yield principle,” in accordance with Alaska’s Constitution. Management and research of fish and wildlife is carried out by five divisions in the department: Commercial Fisheries, Sport Fish, Subsistence, Habitat, and Wildlife Conservation. We also partner with Alaska tribes; state, federal, and municipal agencies; and other organizations to conduct research, monitoring, permitting, and access for resource use and development. 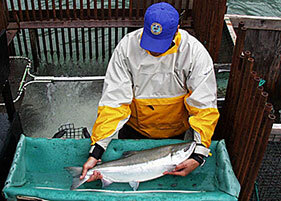 Research projects, hatcheries, stocking, research facilities and more. Birds, mammals, threatened and endangered species and more. Waters programs, habitat research, land management, and more. Research on how Alaskans harvest and use wild resources. Information about the department's management and research programs. Find publications and reports the department has produced. Management plans and planning projects that ADF&G is involved in.